Andy: wow…would be great over pancakes. It has a very strong and very authentic pineapple taste, that I suppose come from the large piece of pineapple floating in the bottle. Definitely one of the best flavored rums I have encountered. Adrian: OK. 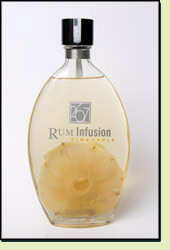 The last time I opened a can of pineapple juice for some tropical drinks, it smelled exactly like this rum. On top of that, the this rum could be the most natural pineapple flavor I’ve ever tasted. There’s a natural quality to the flavor, and it goes down so smooth, just like juice.